If It's Too Loud...: Miles Nielsen and The Rusted Hearts - "Strangers"
Miles Nielsen and The Rusted Hearts - "Strangers"
I always try to make it a point to listen to a song that's sent to us before reading the accompanying press release and band bio. While listening to "Strangers" by Miles Nielsen and The Rusted Hearts, I started making connections, like we music reviewers do. You know what I'm talking about. "It sounds like Band X hung out with Band Y at a drugged up rave," etc. The comparison I made for this song was that it sounds like Cheap Trick meets the current crop of more pop Americana that's all the rage these days. Turns out Miles Nielsen is the son of Rick Nielsen of Cheap Trick, so maybe some things are just hereditary. All family connections aside, you should give "Strangers" a chance. It's a great blast of pop Americana, but more in line with Tom Petty and The Heartbreakers than The Lumineers. It's a confessional song about being able to open up to strangers instead of close friends and family. 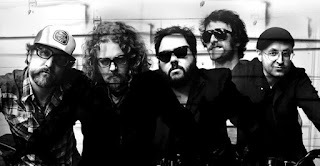 Miles Nielsen and The Rusted Hearts' new album, Heavy Metal, is due out April 29 on Rotown Records. You can listen to "Strangers" over on Soundcloud. For some more information on the band, you can find their website here, and find some tour dates below. Margo Price - "Hurtin' (On the Bottle)"
Julia Jacklin - "Pool Party"
Rolling Blackouts Coastal Fever - "Write Back"
Big Thief - "Real Love"
Charming Disaster - "What Remains"